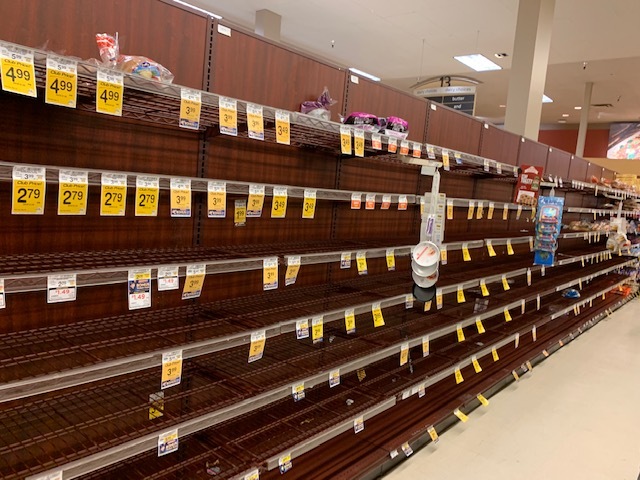 The cupboards were bare at the North City Safeway grocery store on Friday as people stocked up ahead of the snowstorm. By noon the bread shelves were empty as was the dairy case for eggs. Locals stocked up like Floridians ahead of a hurricane. Central Market, Trader Joe's, the Safeways, probably all the grocery stores had bare shelves and very long lines. Many of the stores will restock on Saturday morning. Gov. Inslee declared a state of emergency, but allowed trucks carrying salt and milk to work long hours. All other commercial drives were limited in the number of hours they could drive.